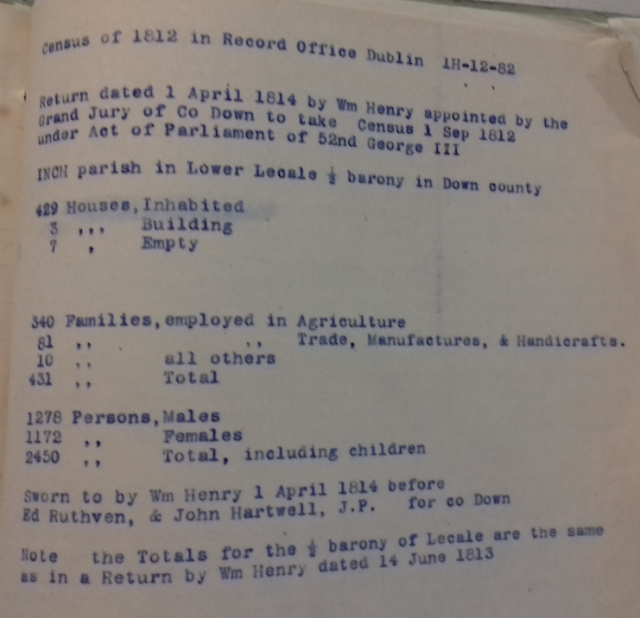 Analysis of deaths registered in the Limavady District that record influenza as a primary or secondary cause of death 1918-1919. 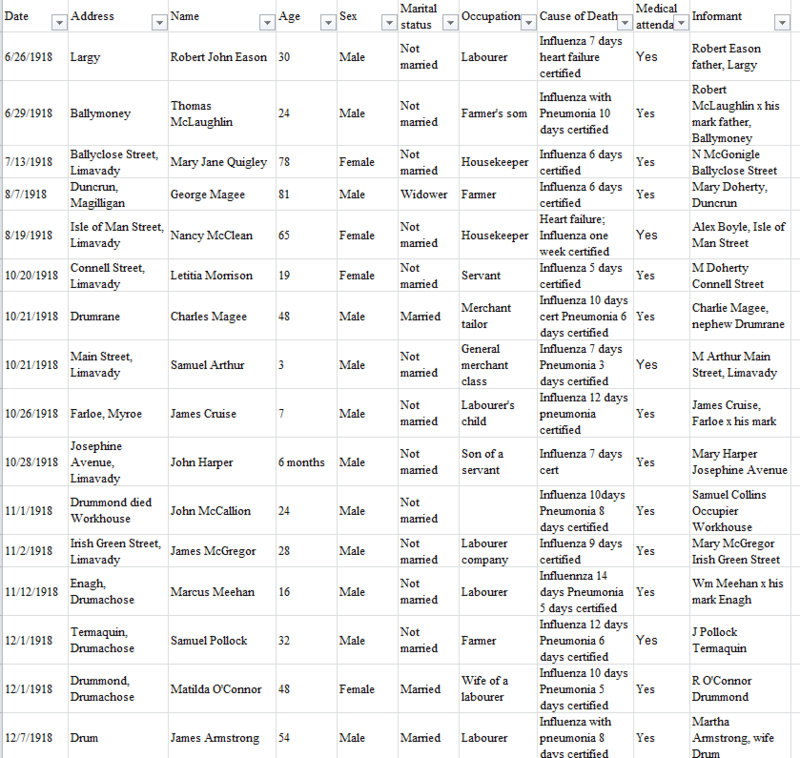 In total from the period 26 June through to 14 October 1919 there were 42 deaths with influenza recorded as a primary or secondary cause of death in the Limavady District (I did not include the data for pneumonia only deaths although most likely there was a correlation). Only occasionally did deaths occur in small clusters but more typically deaths would be spaced out over weeks. 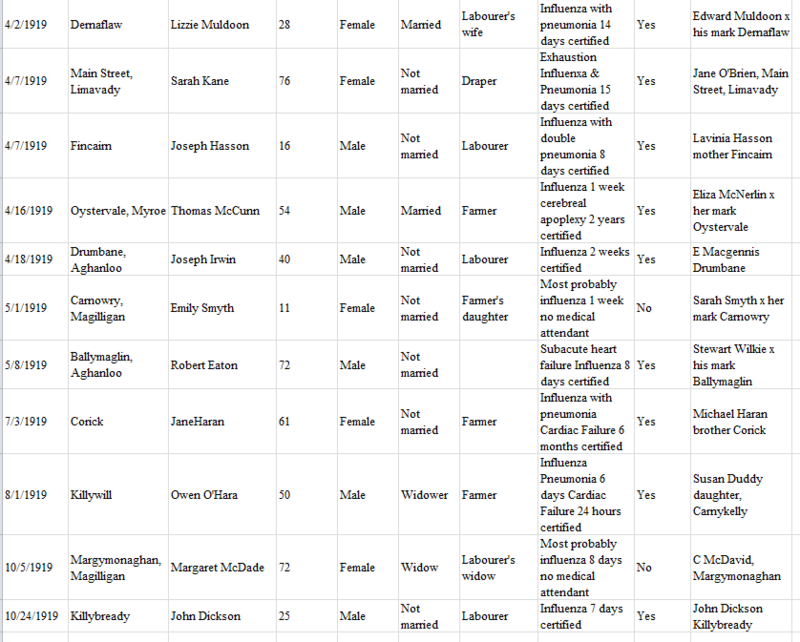 Of the 42 deaths that record influenza on the death certificate 17 were female and 25 male. Only five were less than four years old. The age range was from 10 weeks through to 81 years old. The majority were unmarried (30 out of 42). Most received some kind of basic medical care only four were recorded as having no medical attendant during their illness. Those aged 21 to 30 were disproportionately effected. 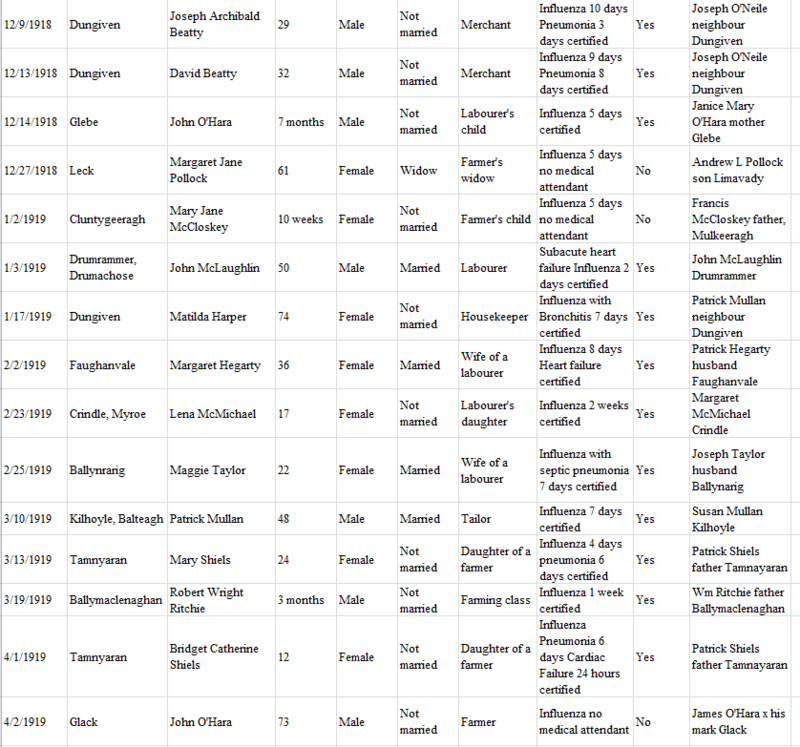 The first recorded death in the summer of 1918 was Robert John Eason a labourer from Largy aged 30 years on 26th June. Deaths of siblings was rare - two brothers by the name of Beatty died within four days of each other in December 1918. Joseph Beatty aged 29 died at Dungiven on 9th December 1918 followed by his 32 year old brother David on 13th December. 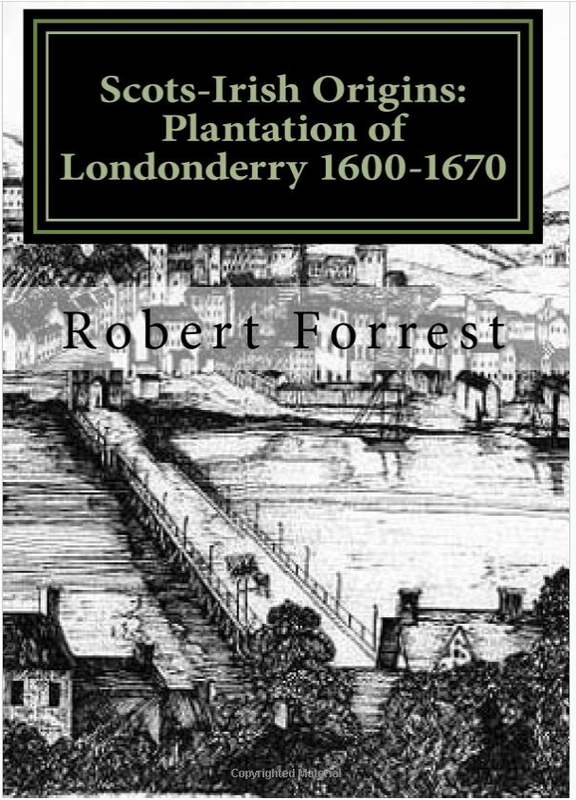 Both were described as merchants. The informant of their deaths was a neighbour Joseph O'Neill. 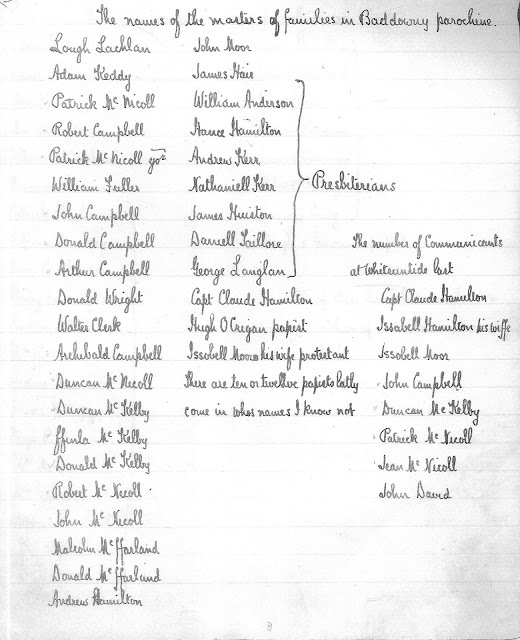 We find the Beatty family in the 1911 census in Dungiven - David Beatty was head of family a general merchant born Co Tyrone aged 23 with his brother Joseph and sister Mary. Two sisters by the name of Shields died Tamniarin Dungiven in 1919. Mary Shiels died 13th March aged 24 and her sister died on the 1st April aged 12. The informant for both deaths was the father Patrick Shiels. 16 deaths were registered as influenza alone. A further 8 deaths were recorded as a combination of influenza with heart disease. Influenza with pneumonia and or bronchitis accounted for the remaining 15 deaths. The last recorded death of the outbreak was John Dickson a 25 year old labourer from Killybready (Aghanloo)who died on the 24th October 1919. It seems from the raw data that the Limavady district was spared the worst of the pandemic. 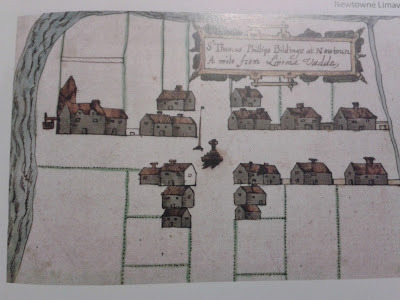 Limavady was only a small market town in 1918 and with satellite villages of Ballykelly and Dungiven it seems very likely that the local inhabitants were all aware of neighbours who had passed away from the effects of the influenza pandemic in the period June 1918 to October 1919.